Take and fill a box: Every Sunday in November, come to the Worship Center lobby to pick up a shoebox and brochure to fill with gifts for a child around the world! Take a Shift at the Processing Center: In the Worship Center Lobby, you can sign up to work a shift at OCC's new Processing Center in Fullerton. You'll be able to help pack boxes, distribute gifts, and organize shipments to bless our international community. 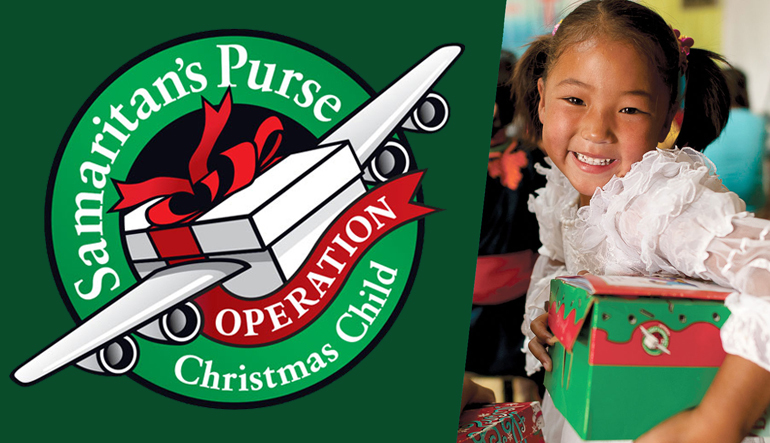 Come to Calvary Christian School's Operation Christmas Child Chapel: This year, CCS is excited to hear from Mr. Hollis, who will be sharing about his personal experience with OCC and how it has impacted both his life, and the lives of children around the world. Join us on Wednesday, November 14 at 8:30am in the Chapel or 10:00am in the Student Underground. On the fist Sunday of each month we invite anyone who is interested in supporting or being involved in Orphan Care (foster, adoption, Safe Families, etc.) to gather to network, learn about resources, support, upcoming events and to pray together. Contact Matt at for more info. The last Sunday of each month, the Faith and Public Policy Ministry meets to discuss ideas and plan ways to engage our Church family in the public square (register to vote, voter guides, how to pray, etc.) Free lunch provided. Contact Matt at for more information. Obria (BirthChoice) is a pro-life medical clinic specializing in well woman and prenatal care for woman at risk. Each Thursday evening, Obria (Birth Choice) hosts a “Beginnings” class at Calvary designed to encourage and support pregnant moms and their families. Volunteers are needed to help facilitate the course and donations of baby items are needed to provide tangible support to each mom. Contact Lauren at or 714.550.2356. In Young Life, we believe in the power of presence. Kids' lives are dramatically influenced when caring adults come alongside them, sharing God's love with them. Young Life leaders have the privilege of knowing and sharing their lives with teenagers and young adults with disabilities. While all Young Life activities are open to every high school student, many Young Life areas have dedicated programs for students and young adults with disabilities, typically referred to as Young Life Capernaum. For more info, contact Alyssa Burgess at . "Sheepfold Nights" is a time when women who have experienced domestic violence from all of the Sheepfold locations in Orange County come together for fellowship and support. This night also welcomes past residents to come and participate, keeping them connected and in community if they choose to be. Volunteers arrive at 6:30 pm for a briefing, and then from 7:00 pm – 8:00 pm. The women go to their support group and the children stay with the volunteers. Fun games and creative crafts are scheduled for the children. Volunteers needed for childcare: infants, preschoolers, and crafts for children ages 6 to 12. This is a great opportunity for small youth groups and families to serve together and for high school and college students needing hours. To volunteer contact, or (714) 237-1444. All proceeds from the Sheepfold Thrift Store help provide shelter and programs for abused woman with children. Duties include moving merchandise from the warehouse to the store, cleaning and organizing aisles and clothing racks. To volunteer contact, or (714) 237-1444.